The winter of 1996-7 generated an exceptional snowpack - twice the longterm normals for the region. 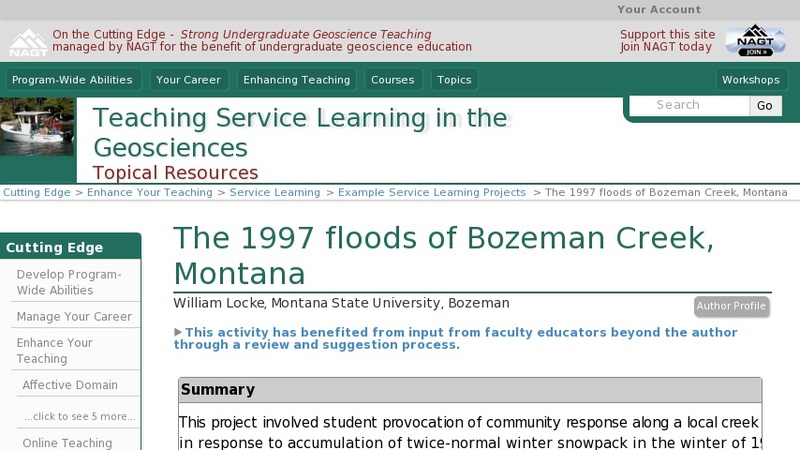 Bozeman Creek through town had not experienced significant flooding (except for high-risk localities) for decades. This seemed like a good opportunity to involve students with a real and identifiable issue of hazard. So, I identified a series of activities through the spring semester to assess the hazard and to mitigate it through community activities. Students signed up for the different activities and, with my active oversight, completed both the science (research, data collection, and analysis) and the outreach before the end of the semester. The actual high water occurred just after graduation. The project was assessed in terms of public perception (before we knew the outcome) and students' (and my) opinion of their, their teammates', and their teams' work.